Looking for a fun cocktail to serve to friends? If you are a gin lover, this cocktail is for you! 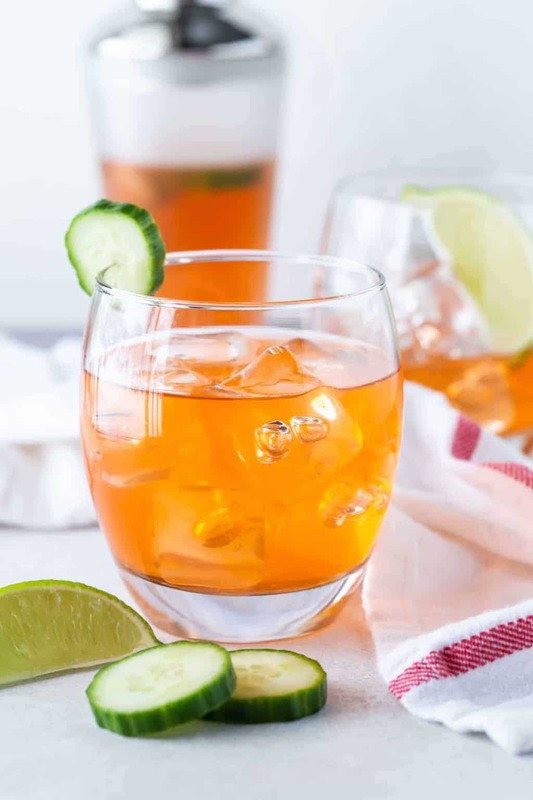 This Aperol Gin Cocktail is a refreshing drink filled with gin, cucumber and lime. If you are local to Minneapolis-St. Paul and have been lucky enough to go to The Dining Studio with Philip Dorwart you know how good it is. In addition to the fabulous food, Philip always has great cocktails and one of my favorites is this Aperol Gin Cocktail. It’s full of fresh spring flavors, and I can guarantee that you have never had a combo like it before. What makes this Aperol Gin Cocktail so special? For starters, it has Aperol in it, an Italian aperitif, that is very similar in taste to Campari but with half the alcohol. Aperol has a bit of a bitter flavor, so it’s not something most people drink straight up or on the rocks. 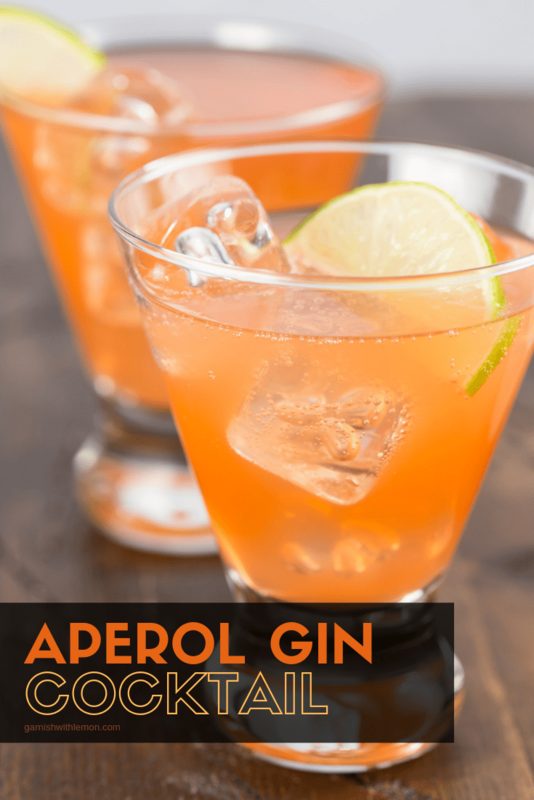 But the low alcohol content of Aperol makes it the perfect mixer for cocktails. Which is why it’s the perfect addition to this Aperol Gin Cocktail. 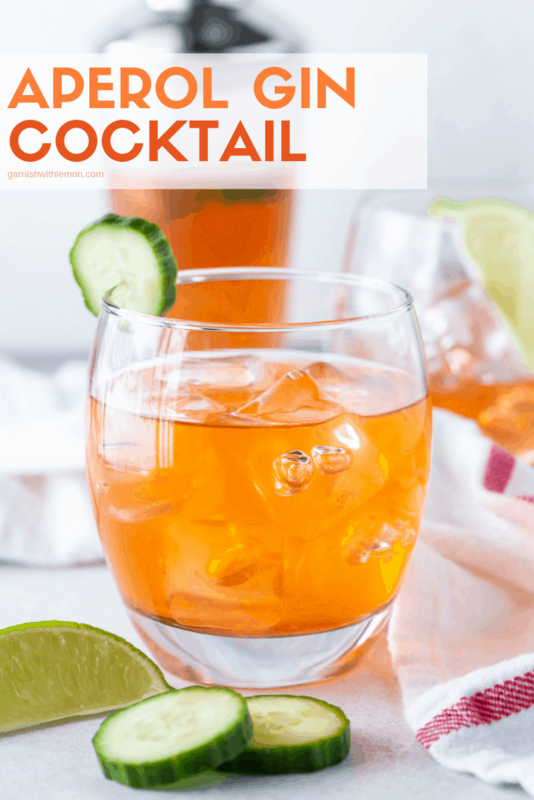 What other ingredients do I need to make this Aperol Cocktail? Not a lot. 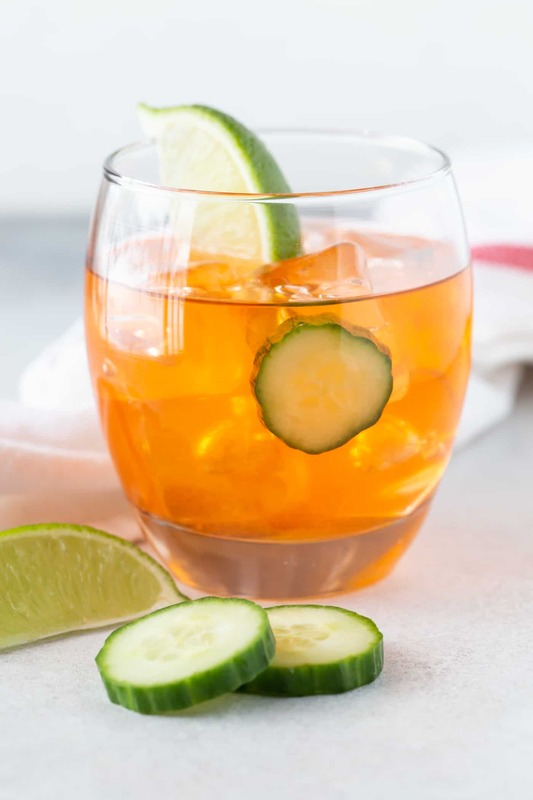 Grab some gin, simple syrup, cucumber slices, and fresh lime juice, and you are on your way to creating a winning cocktail. 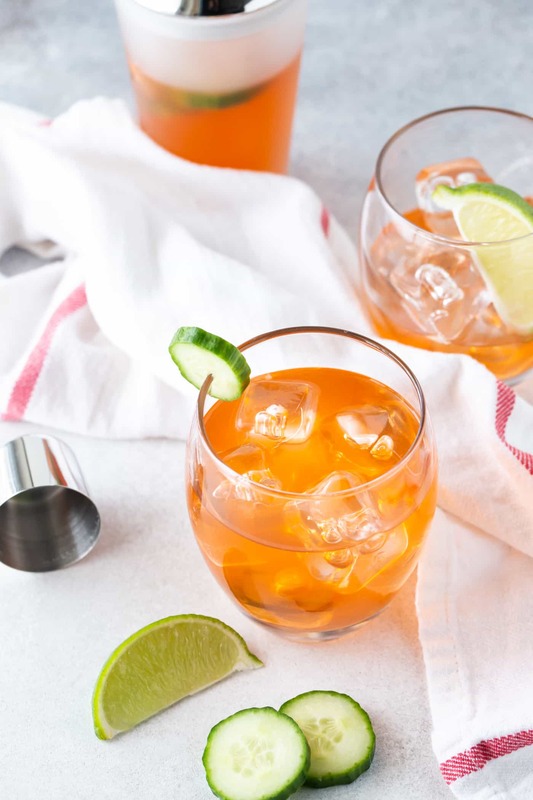 These Aperol Gin cocktails are the perfect addition to your spring party menu. Prep them ahead of time and serve as a batch cocktail. Just wait to add the club soda before serving so they stay bubbly. So if you are looking for a new spring cocktail, look no further. This one is a winner and oh, so pretty to boot! What other cocktails can I make with Aperol? Don’t worry! Now that you have invested in that bright orange bottle of liquor we have some options for you to use it up. For all of you tequila fans, these Grapefruit Aperol Cocktails are crazy delicious. Tequila not your thing? Mix up a batch of these Bourbon Aperol Cocktails for your bourbon-loving friends. And remember, there’s no wrong answer. All are tasty options! Let the flavors of spring shine through in this Aperol GIn Cocktail recipe. Muddle the cucumber in the bottom of a shaker. Add Aperol, gin, lime juice, and simple syrup. Shake vigorously to combine. Strain into 2 low ball glasses filled with ice. Top each glass with a splash of club soda, garnish with a lime slice and serve. Ah! I think I actually have every single one of these ingredients at home! I’m not usually a gin drinker but mixed with some aperol and lime, sounds delightful. Thanks for sharing! If it has gin, I’m going to love it. And that name is amazing. Used 1/2 gin and 1/2 vodka. Best Aperol drink we’ve had. Thanks for the recipe! Thanks for the great feedback. So happy you enjoyed it! Cheers! This is summer in a glass! A bit of Italy for gin lovers.